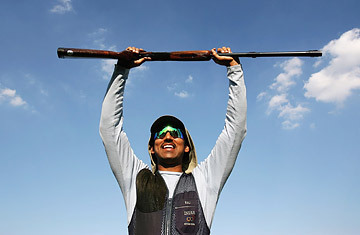 A colonel in the Indian Army, Rajyavardhan Singh Rathore is among India's best hopes for a medal in Beijing. His event is double-trap shooting, in which athletes fire at two airborne clay discs in quick succession. He picked up the sport after training as an Army marksman and won a silver in Athens, but that feat didn't change India's long history of indifference to sports other than cricket and field hockey games against Pakistan. Earlier this year, the head of the National Rifle Association of India complained that the country's competitive shooters had been forced to train with blanks because of a shortage of ammunition. "We did have some hiccups," says Rathore, who has been training in Italy to be closer to an ammo maker. A recent surge of corporate sponsors, including steel titan Lakshmi Mittal, have stepped up to offer their support for some of India's elite athletes, something Rathore calls "a positive change for the country."